He was sentenced to life in prison for non-violent weed charges in ’93. Now see why he’s sparking change in the war on cannabis. Missouri can’t give back 22 years of Jeff Mizanskey’s life that he wasted for a life sentence over marijuana. But his commutation is a great start. During a sting operation in 1993 at a Super 8 motel in Missouri, Jeff Mizanskey was arrested for being involved in the sale of marijuana. 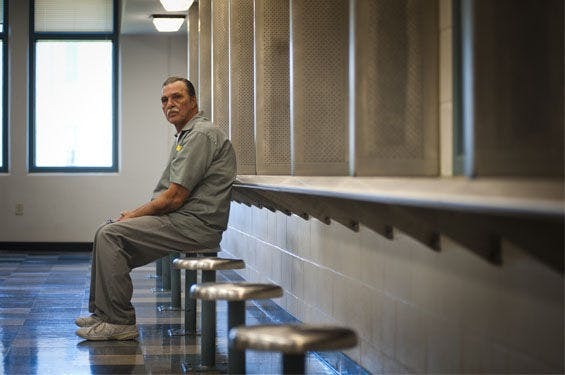 For three non-violent marijuana convictions, Mizanskey, now a 61-year-old grandfather, was given the worst punishment possible – life in prison with no options for getting out. Mizanskey proves that he never belonged in prison in the first place. Out of nearly 22 years of being locked away, his only two write-ups were for putting mail in the wrong slot, and one for a messy cell floor. That’s not exactly what we’d call a typical prisoner who deserves to rot away for the rest of their life. However, Mizanskey’s unjustified punishment came into light when Governor Jay Nixon commuted his sentence along with five other non-violent drug offenders. “In the case of the commutation, my action provides Jeff Mizanskey with the opportunity to demonstrate that he deserves parole,” Nixon stated. Mizanskey’s story is one that is absolutely heart wrenching and proves how incredibly horrendous the failed war on marijuana has been and how many lives have been ruined because of it. This story will bring the baseless cannabis laws into question that much more, and serve as a prototype for other inmates serving similarly harmless, cannabis-related crimes. Even though the state of Missouri can’t give back 22 precious years to Mizanskey, it is a huge leap for justice and yet another step towards ending the war on cannabis. While the world continues to change with the acceptance of cannabis, the commuting of terrible convictions like Mizanskey’s further proves that our laws have been unjustified and wrong from the start. Be sure to share this story to help the support of Mizanskey’s commutation, and ammend the effects of our wrongfully harsh marijuana penalties.